Nothing speaks to my winter-time stomach like a good yummy pot of soup. I have long been a huge fan of Taste of Home magazine. Presently in my cabinet at home, I probably have at leas 100 different issues collected through the years, including the premier issue. Taste of Home soups are full of comfort and goodness, sure to please every person in your family. Second helpings are guaranteed! 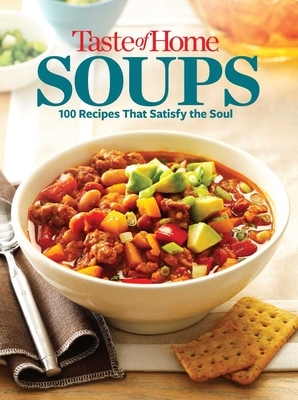 Check out these 100 recipes: definitely soul satisfying! Catherine Cassidy, Taste of Home Editor-in-Chief. Catherine M. Cassidy is Editor-in-Chief of Taste of Home. She is responsible for driving editorial direction and product strategy across the brand's media platforms. They include Taste of Home, the number one food and entertaining magazine in the world; TasteofHome.com; social media; special interest publications; and cookbooks. Cassidy has toured the country as the face of Taste of Home for national and local TV, radio, and newspaper interviews in support of the best-selling Taste of Home products, including its cookbooks. Prior to joining Taste of Home, Cassidy served as Editor-in-Chief of Prevention magazine, the nation's largest health publication, at Rodale, Inc. Cassidy joined Rodale in 1986 as an associate editor in the book division, and was later named Executive Editor of Rodale's Custom Publishing division. She started her career at Runner's World and Fit magazines in Mountain View, California. Cassidy lives in Milwaukee, Wisconsin, with her husband. ABOUT TASTE OF HOME Taste of Home is the leading multi-platform producer of information on food, cooking and entertaining, serving home cooks engaging media that capture the joy and comfort received from food made with love. Taste of Home magazine has a circulation of 2.5 million and publishes Simple & Delicious magazine six times a year; top-selling bookazines; newsstand specials; and popular cookbooks. Tasteofhome.com is a top destination for engaging audiences with kitchen-tested recipes, how-to techniques, cooking videos and lively community forums. Taste of Home has over 4.5 million fans on Facebook, 340,000 Pinterest followers and receives more than 17 million unique monthly visitors. For the best recipes from home cooks, visit tasteofhome.com and follow us on Facebook and Pinterest.